The FTD Big Hug Birthday Bouquet is that perfect way to say Happy Birthday to any of the special people in your life in celebration of their big day! Full of color and life to let them know the party has started, this fresh flower arrangement brings together yellow Asiatic Lilies, red roses, red carnations, yellow chrysanthemums, red mini carnations, blue iris, and lush greens to create an eye-catching display. 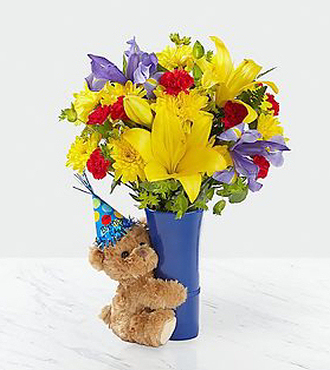 Presented in a blue ceramic vase with a plush brown bear donning a party hat sweetly hugging it tightly on the side, this birthday bouquet is a unique gift blooming with festive fun and love at every turn.